My whole classroom was quiet recently while my little preschool Sunday school class painted with watercolors. Each child created and investigated the colors with the utmost concentration at his or her own level of development. I had one student exploring control of the paintbrush, another trying out lots of color blending, and yet another painting representative objects. They were all equally enthralled. It reminded me how perfect painting activities are for that age group. 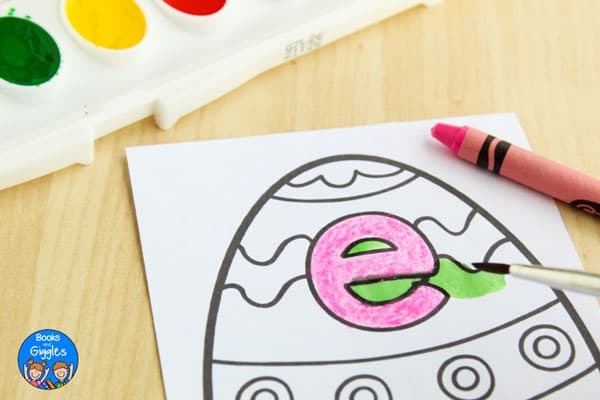 When we dye our real Easter eggs here, one of our favorite decorating methods is drawing on the eggs with a white crayon before dipping them into the dye. The patterns we draw suddenly appear once the color sets everywhere else. 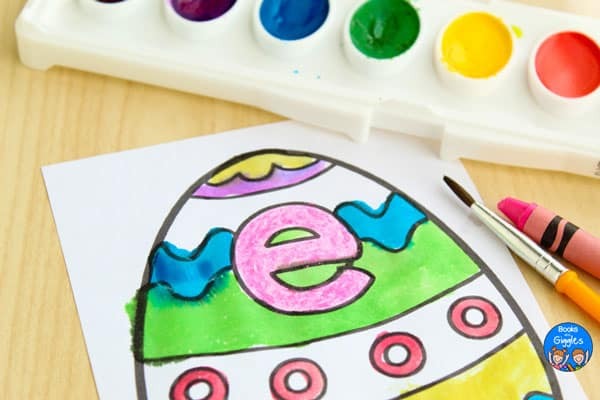 However, eggs are kind of a tricky writing surface – difficult for little hands to manage. 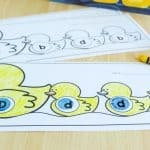 So for this Easter preschool activity, I created a free printable that works kind of the same way. 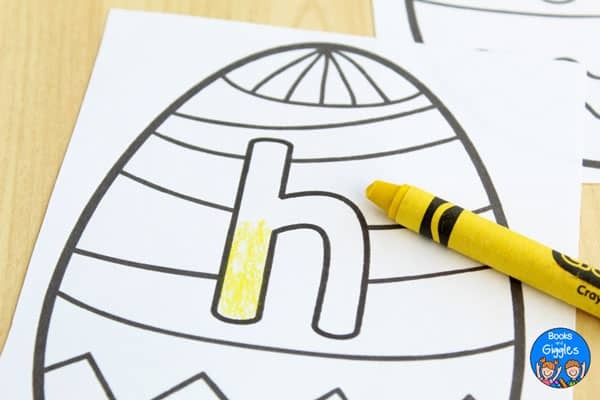 First, children color in the letters with a pastel-colored crayon. Then, they paint over it with watercolors. The crayon resists the paint, making a magical effect. Children learn so much better when they’re motivated and engaged! 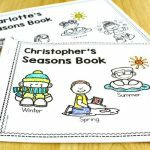 You can print out the whole set, or just choose the pages with letters you need (there are 4 letters per page, so 7 letter pages total). 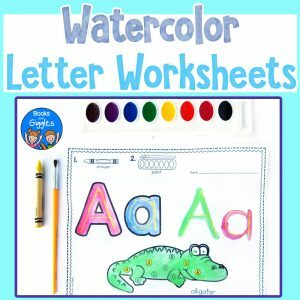 You can make even plan to make this activity super-relevant by giving each child the letter their name starts with. Then, you can let the kids choose exactly how they want each of their eggs to look. 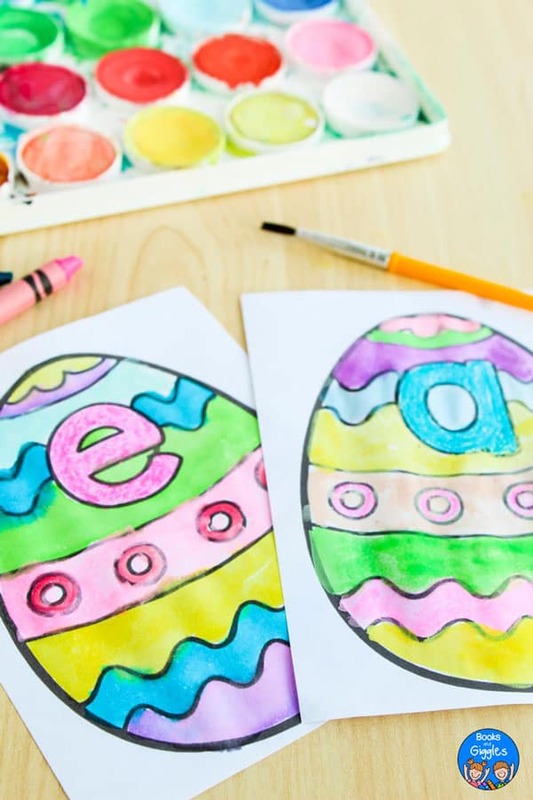 When they’re done, you can cut out each egg to spell names or simple words. 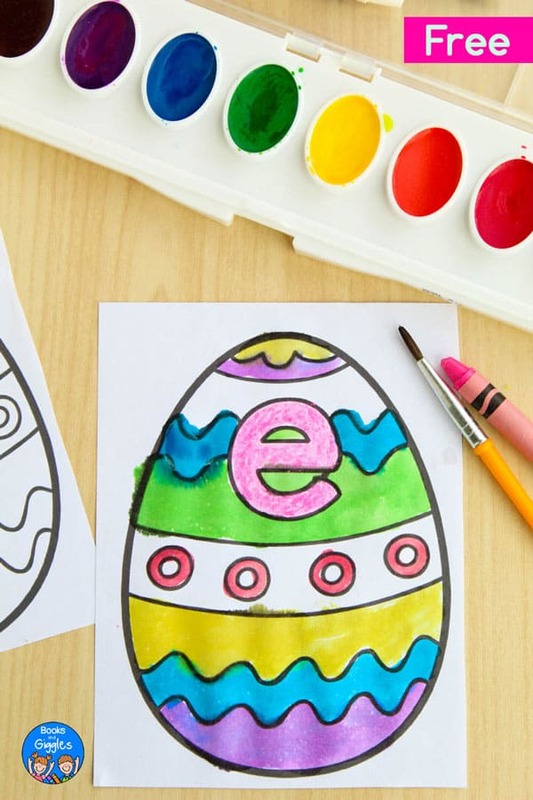 Or string up the letters of the word “Easter”! I think there’s a lot of value in giving children a blank sheet of paper to paint on freely. They get to practice decision making, planning, and focus. Process art gives them a chance to relax and express themselves, and it can build their self-esteem. I also think there’s a place for more structured art activities. 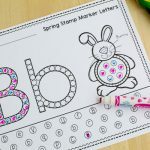 These alphabet Easter eggs fall on the more structured side, but they are still lots of fun! …and fun is often what’s needed to motivate children to work on necessary skills like letter recognition. Yes, your inkjet printer ink will run a little. You’ll have cleaner lines if you can run these off on a copier. 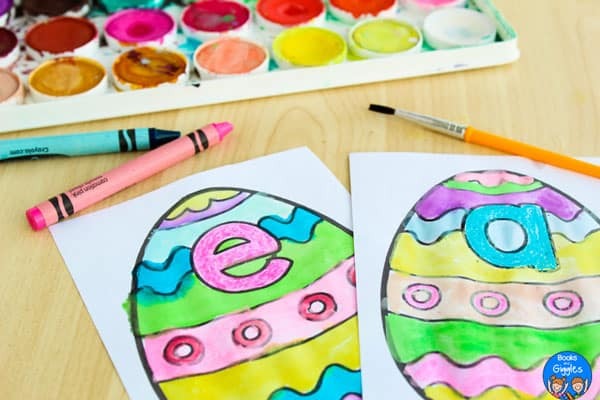 I hope that your kids find themselves completely immersed in making each Easter egg their own. there’s no download file. Would you please verify? Thanks so much for letting me know. I was trying something new. I think I have it working now. Let me know if you have any further problem with it. I’m sorry you’re having trouble. Look under the section called Instructions & Materials. I just checked, and it is working correctly on both desktop and mobile.